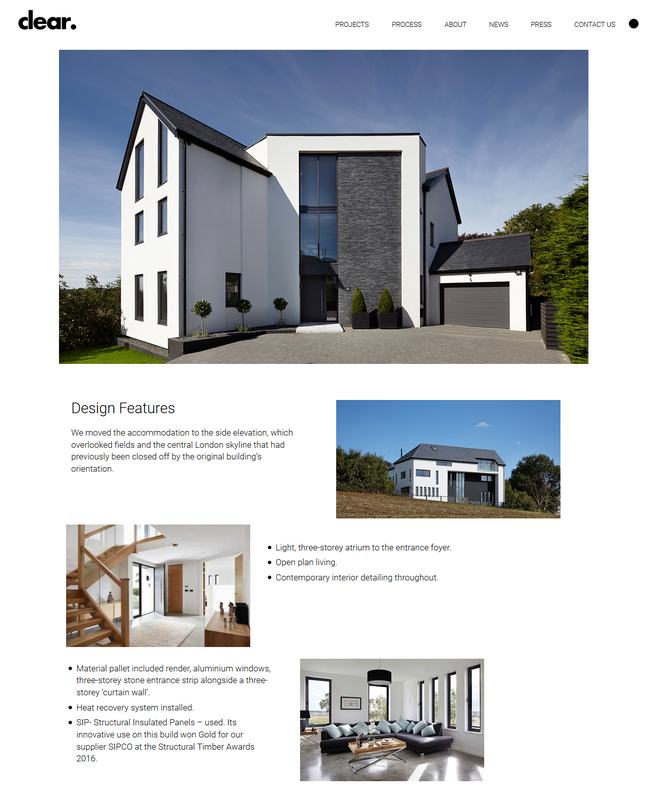 Luminescence was commissioned to create a new website for Clear Architects to attract prospects from the South East and that showcases the high-quality architecture they create. The new website was designed, developed and delivered by Luminescence as part of a wider Communications Strategy to increase brand awareness and lead generation for the architecture practice. This formed part of our award-winning Professional Services Marketing Campaign at the Construction Marketing Awards 2017. Luminescence built a team of specialists around this website project to achieve the client’s business and communications objectives. We know that a successful website – much like successful architecture – is one that combines superb design with smart and intuitive functionality. The unique magazine-style page layouts allowed the client to showcase a broader selection of images and information about each project, providing flexibility with different elements that can be tailored to each project. 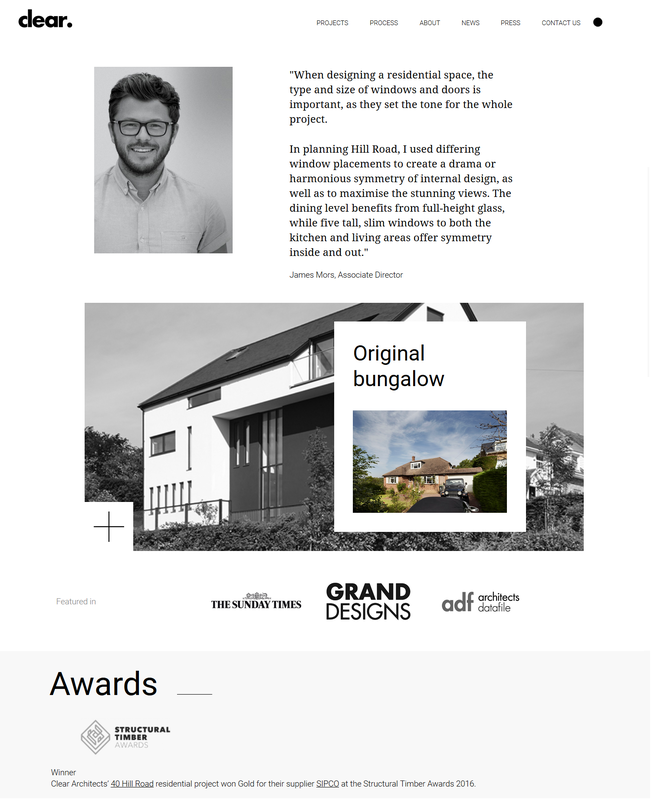 Among these were options for highlighting before/after imagery, elevation drawings, specialist build materials, multi-media functionality, the lead architect’s personal comments and a ‘featured in’ media ans awards logo section. 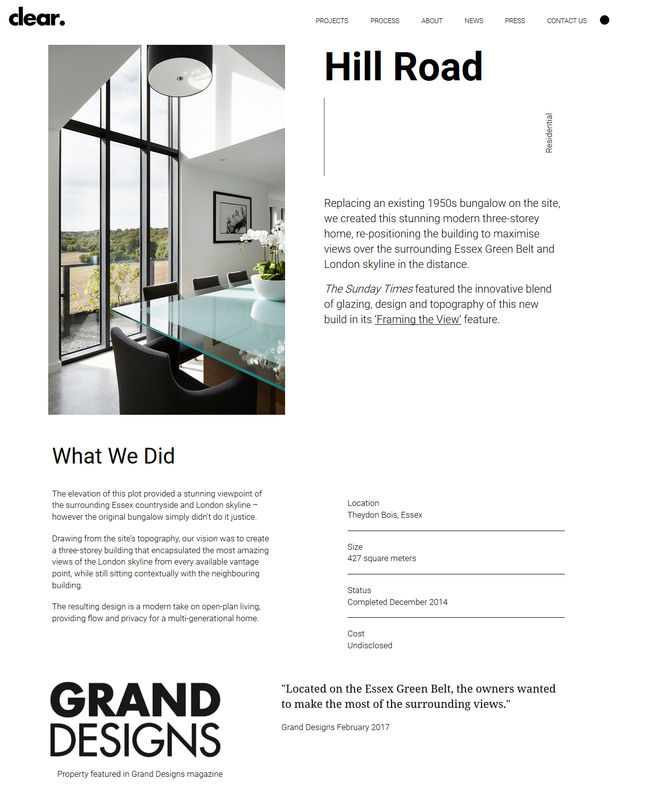 All of these features, and the flexibility they afford to ‘tell the story’ of how each project brief has been approached and delivered, is in stark contrast with many architect websites that typically rely on a carousel of static images. Pull-out information about the project, quotes from media and clear design on the newly designed project pages. Design features were highlighted describing why architectural decisions were made and showing the impact of these on the completed build. An essential part of the website project was to generate leads, whether from interested prospects at research phase or ready to commission an architect. It was imperative that we include clear calls-to-action at the bottom of the main pages, as well as a newsletter sign up ‘element’ that could be placed on any page to capture prospects’ email addresses for future marketing purposes. Having plugged in Google Analytics for measurement and monitoring, we were able to compare the performance of the old and new websites immediately.